In my defense, I knew you could cook corn right on your barbecue grill, so I suspected that the oven technique would be about the same. But before I went and ruined a bunch of fresh-from-the-farmers’-market corn, I googled and found what I needed to know courtesy of Tyler Florence, who I assume is someone on the Food Network (never seen it). The instructions couldn’t be simpler: Preheat oven to 350F, put corn (in husk) directly on the rack, and roast for 30 minutes or until tender. The husk traps the steam so the corn cooks in its own moisture. 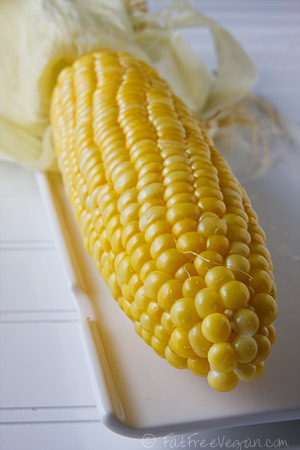 Once cooked, the silks come off the corn much more easily than they do with uncooked corn. Tyler (I call him that now that I know who he is) says to peel down the husks after cooking and use them as a handle for eating, and you can—I tried it—but it’s a little messy. If you’re eating outside, it’s fun and kind of rustic to hold your corn by its own natural handle, but errant silks do tend to get all over the place. If you’re eating inside, I suggest peeling the husks back and then cutting them off with a big chef’s knife. You can then decorate your cob with your favorite cute corn holder. Now the real beauty of this technique, beyond the fact that you just set your timer and work on the rest of your meal while your corn cooks, is that roasted corn has so much more flavor than boiled or [horrors!] microwaved corn. I should know because my favorite fast-cook way to make corn is in that dreaded appliance (in husk, 2 minutes on high power, let rest for 2 more before eating). Normally I like to sprinkle lime juice and seasoned salt on my corn (as mentioned here), but oven roasting brings out so much sweet flavor that I just eat it au natural. You can’t get much healthier or easier than that! P.S. Just had to add that if you have a large toaster oven, you can cook it in it, too. It heats up the house a lot less than the regular oven and saves energy. I fixed this as a side dish for dinner tonight and it was PERFECT! The corn was so tender and sweet. It had a wonderful taste and I added nothing to it. I will NEVER, EVER, EVER be boiling corn again! Thanks so much for this idea! So, I’m 44, and decided that today i would try to cook pork spare ribs (on sale). I went online, found the easiest recipe, as my spice rack is lacking. Now the ribs are cooking … eeeeeeeee!!!!! I can’t wait!!! Then i remembered the sweet corn on the cob. I thought – wow, that would go really well with the ribs. Then i went blank again. I started playing with the corn in the husk – debating wether or not i should shuck it and wrap itin foil w/ a bit of water, butter, salt, or wrap it w/ foil over the husk; or if i don’t shuck it, won’t the husk dry out and burst into flames? Then i saw your fabulous recipe… stick it in the oven I can do, and so much simpler that boiling! I will stick it into the oven 30 mins before ribs are done. THANK YOU !!!!! I also need to lose about 70 lbs., so i will be trying out MANY of your sinless recipes. 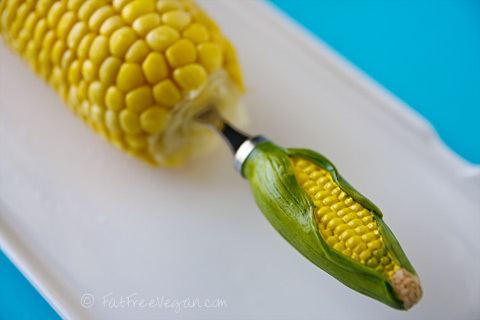 Anyhow, my cousin is super happy to know that we don’t have to shuck & de-silk the corn prior to grilling, and I am super happy that this site came up when I searched google for a vegan corn in the husk recipe… I just recently went vegan and this looks like a site that will be very helpful in the coming months. I will definitely be back! Two great ideas! I’ve always been boiling corn or grilling it and never thought of the oven. It sounds so simple! I love the oven recently – just throw in my sweet potatoes or turkey and it’s done. Also great idea with lime – it makes it perfect with spices. I am not a vegan but love all kinds of vegetables and vegan dishes. Your site is just an incredible source! Thank you! My husband does most of the cooking. But, I have decided that I would like to try a vegan-ish diet. So, I was making a casserole in the oven and decided to try roasting an ear of corn. My husband the naysayer, boiled his corn. Mine was so much better. He now roasts his corn in the oven after trying mine. @ Janis… Vegan-ish? Haha. That’s like semi-celibate? Partly wholesome? Part-time carnivore? @ J Jarmusch: Why are you so unfriendly? This lady is probably not a vegan, she is trying new healthy recipes, which is always good regardless food preferences. PS– that same natural healing cookbook (and a bunch of online sites) also suggest putting brewer’s yeast on pop corn…..just one of those things I’ve yet to try but have seen everywhere and everyone says its great….and considering the health benefits of brewer’s yeast, I’m considering having to try it soon….have you? I don’t like brewer’s yeast, but I do like nutritional yeast on popcorn. Sometimes people call nutritional yeast “brewer’s,” so maybe they mean that; the only brewer’s yeast I’ve had was bitter and yeasty, not savory and cheesy like NY. So glad you liked the corn! It’s amazing how something so simple can be so good. @ SusanV… You’re absolutely right. People often mistakenly call nutritional yeast by the name of brewer’s yeast. 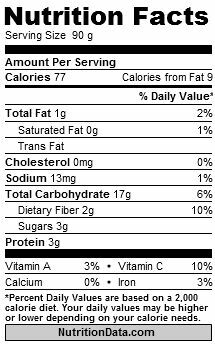 Nutritional yeast has been deactivated and has tons of beneficial nutrients, e.g., B vitamins, eaten as is. They are literally two separate creatures. In fact, there is more difference between different yeasts, fungus, etc than there is between a homo sapiens and a, for example, generic bovine. Put catsup on corn just like you would butter.Everybody i mention this to goes yuk,but I think it’s better than butter.With the lime it might be even better. 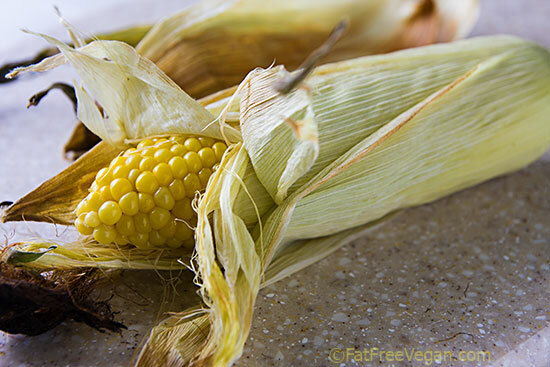 Yum– but here’s the easiest and best way of all to eat fresh corn on the cob. Some years ago I worked near a farm veggie stand, got friendly with the farmer’s wife and one day she took an ear from the stand, shucked it, broke it in half, gave me a piece, and started munching away. Let me tell you, raw fresh corn on the cob is Nirvana! I knew I should have bought that corn yesterday…Great idea! I’ll be trying this… I have a dozen ears of corn in my garage fridge that I almost forgot about! Tomorrow oven roasted corn!! Thanks so much! I made your eggplant and chickpea curry tonight as a side (which, by the way, was delicious, even though I skipped the chickpeas–as a fellow Aubergine Admirer, I greatly appreciate your multifarious eggplant recipes! ), and I stuck the corn right in with the roasting eggplant at 400 and let it cook for 25 minutes. I was a little nervous to play with the temperature and time, but since I had to get dinner together quickly, I decided why not give it a shot. Well, the corn was perfect! No hassle. No fuss. No remove-the-silks-then-tie-the-husks-back-together-with-string mess like I’d foolishly done before. Just delicious Jersey corn cooked the easiest way EVER! Thanks! What happens to the worms in the corn, do they just bake in??? You can peel back the husks to check for worms. If there are any worms, they’ll be right on the end so no need to peel them completely. Then pull the husks and silks back around the corn and bake. Thank you! This is a huge help. The simpler the better! I have five ears in the oven right now and can’t wait to taste some when they’re done! I was wondering if this would be a good way of cooking the corn on the cob and researched the internet and found your site. Thank you for the above information. I like to hydrate the corn for about an hour, submerged completely in water. Also, adding a bit of sugar to the water, makes it sweeter (but, it’s sweet enough already). Thanks for sharing this! I haven’t cooked corn on the cob before, and didn’t know how to cook it in the oven! Would you add that if the corn on cob has already had the husks removed before you bought it at the store or farmers market, then wrap the cobs in foil? I have foil on hand but there may be other methods of keeping the moisture in the corn so it can cook in its own juices. I was going to oil the corn first until I read about how delicious your corn came out roasted in the oven. I live near the Navajo Nation and at many events, such as outdoor fairs, there is usually a corn roaster the size of a 50 gallon drum filled with roasting corn. It is very popular. People peel down the husks to grasp the cob while eating the corn. Every time we eat corn, we are reminded of corns indigenous roots in the Americas. It makes eating corn more fun. Have you ever tried “cooler corn?” This way is great if you are bringing corn to a picnic or other gathering. Clean your cooler well, shuck the corn, place it in the cooler, and pour in boiling water (stock pot full). Close the lid and let it steam for about 20 minutes. Drain out most of the water being careful not to get burned. With the lid closed, it’ll stay hot for quite a while. I wonder now if it wouldn’t work without shucking the corn. I also cook my corn in the microwave about 3 minutes per ear, with the husks on The silk comes off so easy, and it is fabulous. Don’t have to heat up the kitchen when it’s hot outside.